18-karat white gold bezel set with brilliant-cut diamonds. Opaline guillocé dial, date counter. 18-karat white gold crown and onyx cabochon. 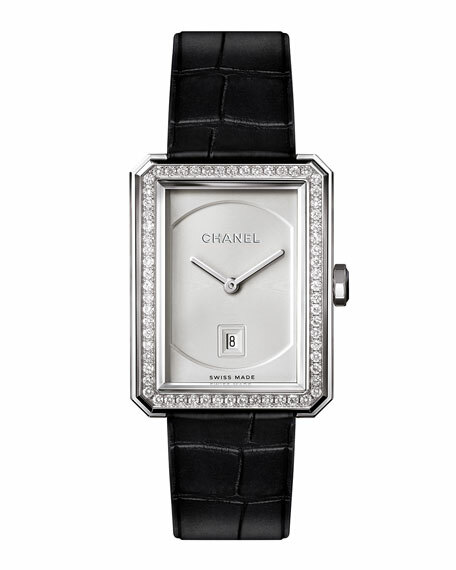 Black alligator strap and 18-karat white gold buckle set with 48 brilliant-cut diamonds. Dimensions: 26.7mm x 34.6mm x 7.33mm. Additional strap colors may be available in store. Please call 1.800.824.5440 to check availability.